The latest updates: what I'm working on in the studio, and new artwork and talismans available in the shop. Writings on various topics and themes, photos from my travels, and more. Looking southeast from the Sanctuary towards the Sandias and home on the far horizon. Not long after we moved here 19 years ago, we discovered Ojito Wilderness, a pristine area on public land near Zia and Jemez Pueblos. Back then it was still years away from its official Wilderness designation, but we were amazed at how remote it felt, given its relative proximity to Albuquerque and Santa Fe. It became an instant favorite for hiking. For such a small area, Ojito and surrounds have a huge variety of landscapes varying from bentonite badlands to pinon-juniper forest to Anasazi ruins. Fossils abound. (Several years ago, some hikers found what looked like fossilized bones. They turned out to be those of a seismosaurus, one of the largest dinosaurs ever discovered. After months of extracting them from the hard sandstone, they're now in the New Mexico Museum of Natural History. Curiously enough, I happened to tour the museum's fossil repository the evening after I wrote this, and saw the actual section of vertebrae. They are huge. Photos of them are in the set below.) Over the years we've found petrified wood, fossilized dinosaur teeth, and gastroliths. I've taken imprints of clamshells embedded in mesa cliffs for jewelry. Even today I still discover something new every time I go. The view to the southwest. A butte of bentonite hills with a sandstone cap. 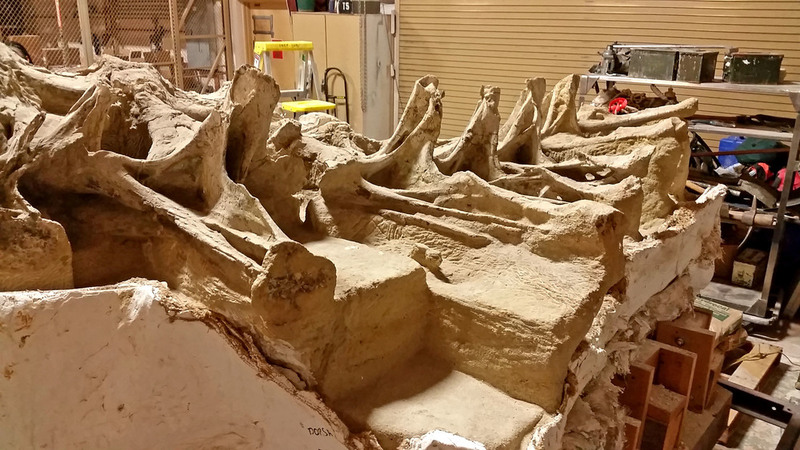 The seismosaurus vertebrae. This section is lying on its side; the top of the bones are to the right. Petrified wood: an especially beautiful segment of tree trunk. Weathered juniper: sculpture made from time and light. I took these pictures on my phone back in March. It was one of those stunningly clear days that I just love. My husband, Michael, and I hiked to a remote section that I call the Sanctuary. It has a special feeling, and it's one of the most beautiful places I've found in Northern New Mexico. Elk trails lead to formations of pale golden-white sandstone create alcoves, labyrinths and rooms floored with fine cream colored sand. Hoodoos tower above, with dark ochre mesa cliffs as a backdrop. In places, the ground is strewn with logs and fragments of remarkable gold and white petrified wood. A relict population of Ponderosa pines, many stunted into bonsai shapes, provide shade. The balsamic vanilla fragrance of their bark floats on the breeze. There's such a sense of tranquility there...a beautiful place for dreaming and contemplation. Relict ponderosas with juniper and pinon, looking toward Zia Pueblo in the distance. Dwarf ponderosa, remnant of the Ice Age. More hoodoos and stonescapes. Yes, the sky really was that blue. Some people ask why we "need" wilderness. I think that if you even have to ask, you may never understand the answer. The reality of it, and the experience of being in places like this, go far beyond words. And it is absolutely necessary to our wholeness and well-being.